Below: Richard Harris poses beside the Pearse River. The age of international travel is amazing. Just 25 hours after leaving Adelaide in South Australia, I am in a helicopter touching down in the remote Pearse Valley, a few hundred metres from the resurgence of the Pearse River. Over at the camp, Australias Dave Apperley and British cave diver Rick Stanton watch with interest as Craig Howell, John Atkinson, and I unload the chopper and move aside as it departs, leaving us in the glorious wilderness of the Kahurangi National Park, New Zealand. 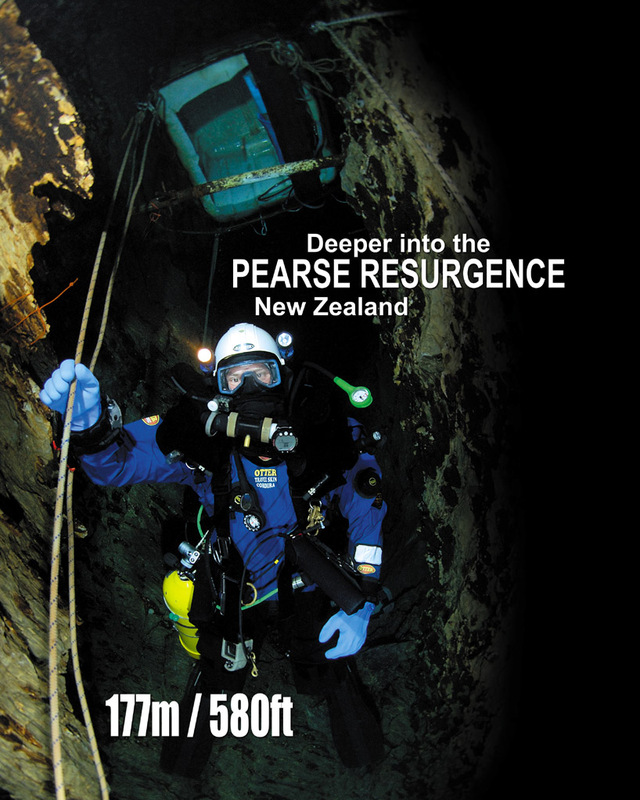 We are here to dive the Pearse Resurgence, currently the deepest and one of the most challenging water filled caves in Australia and New Zealand. With water temperatures of 6-7 degrees Celsius, periods of high flow, and the stigma of a diving fatality in 1995, the cave presents as much of a psychological challenge as it does a physical one. With my regular dive sites between 12 and 20 degrees, the icy water was playing heavily on my mind! Progress in the cave has been hard won over the years. 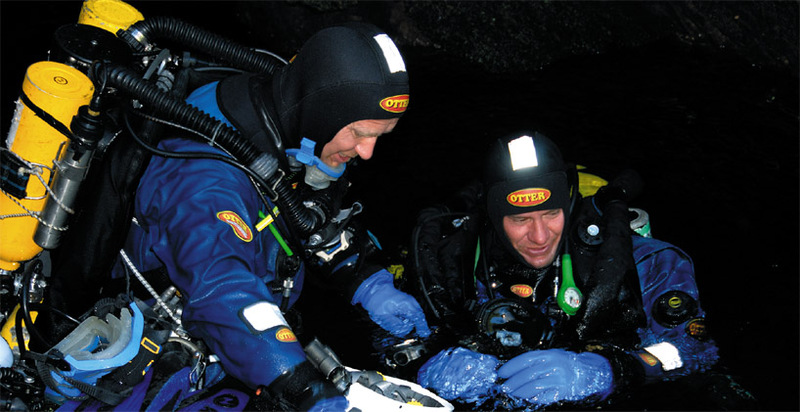 Keith Dekkers, Kieran McKay, Dave Apperley, Tim Cashman, Chris Brown, David Doolette, and others have made incremental advances since the cave was first dived in 1975. We feel that we have come well prepared to push the cave. Dave Apperley is a veteran of numerous expeditions here, and has developed excellent systems for exploration. A habitat is installed in an early section of passage at 6m in which divers can decompress in relative comfort. Surface supplied oxygen fed into the habitat means the divers can optimize their decompression, and the Otter dry suits and Typhoon heated vests will help keep us warm for the last two hours on big dives. With the exception of John Atkinson, who will be doing shallower dives, we are all using mixed gas closed circuit rebreathers. So after twenty-four hours of travel and very little sleep on route, Craig, John, and I set up camp. We join Dave and Rick to catch up on their progress. Dave has spent the last couple of days setting up the camp and preparing the habitat while Rick has been caving on the well-known Nettlebed Cave through-trip with some locals. John feels fresher than we do, so decides on a dive before dinner to stage two tanks for the team. Back on the surface, Dave and then Rick descend into the cave on their dives. The absent stage bottle is probably noted, but as the planned dives were not deep or long, little concern is raised. Craig and I are still settling in to camp, and only start to become concerned about 90 minutes after John commenced his dive. Right page : Craig Howell descends within the Nightmare Crescent. Below: Richard Harris and Craig Howell prepare for a deep excursion into the unknown depths of the Pearse Resurgence. Initially, my dive was very enjoyable and relaxing. As I passed 23m, my vision seemed to flex, as though rivulets of water were running down my mask. I grabbed the shot line to stop my descent, and quickly clipped off one of the extra tanks. I knew that something was very wrong, and I needed to get out immediately. I couldnt get rid of the other tank, I was too dizzy. After going up only a few metres, the whole shaft began to twist and spin violently. I had the line in my hand, but couldnt tell which way was up. I felt myself being flung against the side of the shaft by vertigo. Grit and sand came away from the walls, and the visibility disappeared. It was as though something had taken hold and was throwing me about the cave, and that same thing was pressing blackness just behind my vision. I was terrified that I would pass out. I had managed to not lose the shot line, and somehow found myself at the top of it. I tried to swim out of the cave and realised I was going the wrong way. I came to another line junction. I could see the ripple of surface reflections and finned towards them. I surfaced in what I could immediately see was an air chamber. I wasnt out, I was trapped. I knew that, if I tried to dive again, I would die. I didnt know the way out. The other guys were planning a longer dive that day. Rick would see one of his cylinders was not clipped to the line. But what would he make of that? Dave had told me about the chamber, but said hed never been there. Did he know the way? And when would he notice I was overdue? I couldnt see anywhere to lie out of the water, and I still felt terrible. Ive waited for over thirty hours in a cave before, but that was sitting in a dry passage with food to eat. In my current state, floating in seven degree water, I wasnt sure how long I would survive. The neck of the dry suit was too tight, and I pulled it away from my throat. I decided I had to stay where I was and get as comfortable as possible. I managed to get myself out of the water on a knife-edged rock. I wrote on my slate that I would wait until Dave found me. Above: A helicopter was required to ferry the divers and gear the last few miles into the site. Below: After 3 days of torrential rain, the Pearse flooded in a spectacular fashion! After about forty minutes, I had to take my suit off because the neck seal was cutting in too much. Getting the zipper open was difficult, but once out of it, I felt better straight away. I was checking the water all the time for lights. I thought of lowering a light on my search reel to attract attention but wanted to save the batteries, and I had no idea if the guys would be swimming below me or not. Sometimes I thought I saw lights, but it was only a reflection from my own torch. Then the rift underneath me was outlined by a bright blue glow. I grabbed my helmet, turned on the most powerful light and put it under the water, waving it about and flashing the beam with my hand. But the glow faded away and disappeared into black. After about twenty minutes, another glow appeared. I flashed my light but the glow faded away. I thought about getting dressed so I could dive down if the light reappeared. I was still very off-balance and had trouble thinking clearly. If I tried to dive, I didnt know if I would stay conscious, or if I could come back to the chamber. Then the whole rift and pool lit up. It had to be Dave with his bloody great camera light. Then my instinct just said go for it! I got my gear on as fast as I could and dropped down the line with my vision narrowing, one hand sliding down the wall by the line to keep balance. I could see Daves helmet lights below, and then the outline of his yellow rebreather case. I couldnt tell if he saw me or not, even after I signalled with a loose torch. I was so dizzy. I didnt want to leave the wall and swim to him, but after a minute he came up and we surfaced in the chamber together. Below: Dave Apperley in the entrance pool, armed with scooter, 200W HMI light and video! It wasnt the amount of gas I had that was bothering me; it was staying conscious so I could use it. But Id been waiting there for an hour and a half at that point, and Id really had enough of that chamber! With Dave holding my hand for balance, we dropped down to 17m and the main line. Twice going out I lost the line when it ran under rock projections. If Dave hadnt been with me, I wouldnt have made it. It had been smart not to try and find my own way out. The next day Craig and I (with growing respect for the cave!) both have uneventful shakedown dives to the bottom of the main shaft at 105m. The experience of following Dave down with the shaft illuminated by his SS HMI light is one I will never forget! Dave and Rick continue pushing the cave, and over the next few days we are passing Daves previous exploration to the back of the Big Room and beyond. This point has defied further exploration for the last few trips. The cave is hard on equipment and diver alike, and to finally pass this point is a huge relief, especially for Dave who has battled the cave on so many occasions. It is soon clear that two leads extend from the far side of the Big Room. The lower, larger one (now called the Brooklyn Exit) is dark and cavernous, and drops away at a steep angle before starting to level off into the M40. It finally ends at nearly 160m with another abyssal shaft dropping down into the blackness! Rick and Dave alternately push the deeper section of the cave laying 6mm line from an improvised reel, the dives leapfrogging to 157m, 160m, then finally Ricks astonishing, record-breaking dive to 177m. Harry and Craig happily fall into a supporting role, and make their own exploration dives to 137m. 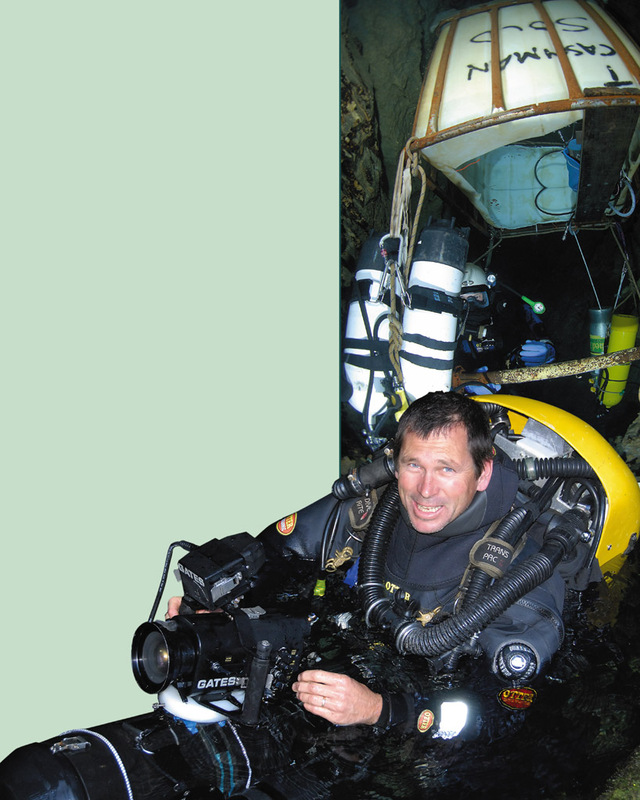 Ricks final dive to 177m is performed using his side-mount rebreather, and has a total duration of 6 1/2 hours. The final two hours are spent in the relative comfort of the habitat breathing oxygen at 6m, listening to Craigs MP3 player, and eating chocolate. He surfaces at 9 p.m. to a cold, rainy night and his anxiously waiting buddies! He has discovered that the deepest section of the cave curves back underneath itself then again pushes onward, deeper and longer. 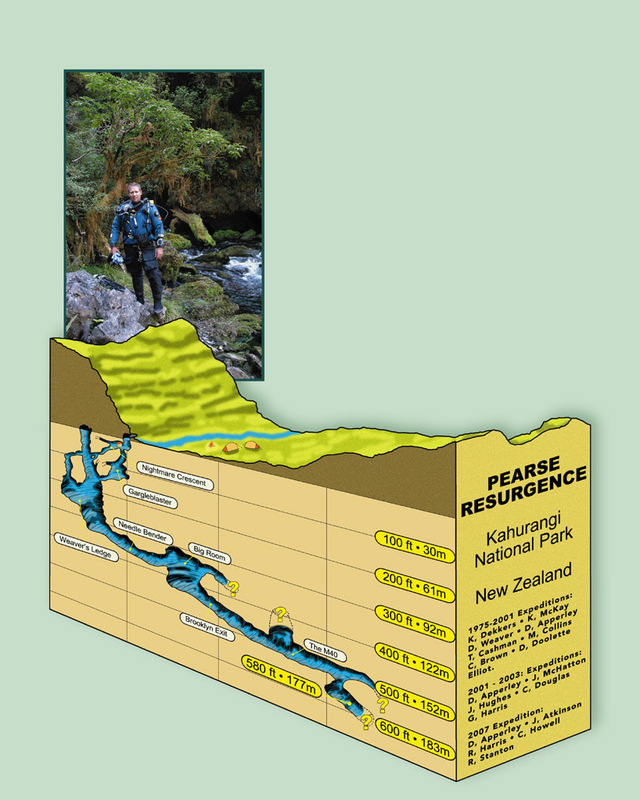 The Pearse Resurgence is becoming a serious obstacle to exploration! The sudden and near fatal onset of vertigo and perceptual narrowing during the descent phase of Johns dive is extremely interesting from a diving medicine perspective. Vertigo describes the sensation whereby the victim feels as if the surrounding environment takes on a spinning motion. It is completely disabling as all normal visual reference points are lost. Up and down, left and right become indistinguishable. Severe nausea and often vomiting follow. In the context of diving, there are several well recognised causes of vertigo, some of which can be immediately discounted. Inner Ear Decompression Illness (IEDCI) is now well described in both air and mixed gas divers. However, as the problem occurred on the initial descent, that is not the cause here. Inner Ear Barotrauma (IEBT) which can occur by similar mechanisms to middle ear barotraumas, i.e. failure to adequately equalise the pressure changes occurring within the middle ear. John did not describe any difficulty equalizing at any time, nor did he forcefully equalise during the descent. Alternobaric vertigo is a possible explanation. In this problem, one middle ear space equalizing at a different rate to the other can indirectly cause a pressure difference between the two inner ears, producing transient vertigo. A recent upper respiratory infection or viral illness could perhaps pre-dispose to this condition. Caloric vertigo (the sudden filling of one external ear canal with cold water causing dizziness) is also a possibility in the icy waters of the Pearse. Johns history of a recent illness, and the fact that he continued to feel unwell for some weeks after the event, suggests that this was a contributing factor. A viral infection of the balance mechanism of the inner ear in combination perhaps with alternobaric or caloric stimuli is the most likely cause in the authors opinion. 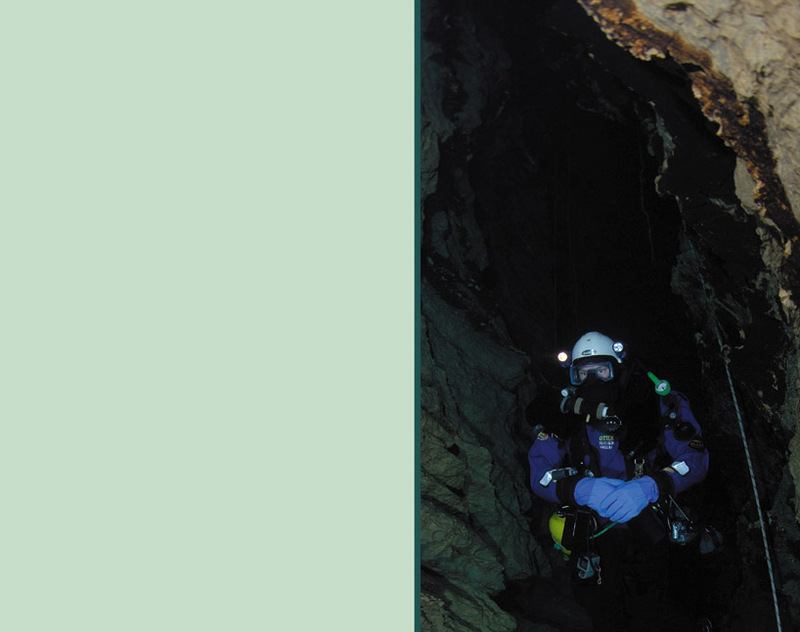 The perceptual narrowing or feeling of impending unconsciousness is well described in the cave diving fraternity, when divers feel faced with their probable death. NZTech07 would like to thank the following for their sponsorship or assistance: Dive Rite Australia, Otter Dry Suits, Typhoon International, DiveTek Australia, Sport Diving Magazine and Barry Andrewartha, Pelican Australia, Golem Gear, Neil Miller and DiveOz, Seaoptics Australia, TDI Australia, Submerge Scooters, Oz Patterson and the NZSS and Action Helicopters.